Hello Joey. Thank you for taking a break from your work in the studio to answer a couple of questions. So, what’s going on in the kingdom of MANOWAR? Joey: Quite a lot! First of all: After 16 years, MANOWAR will return with a mighty ‘Hail!’ to England, Ireland, Northern Ireland, Scotland and Wales. Why is it, whenever I have a preappointed phone interview with some band, every mutha in the world wants to ring me at exactly that time? It’s some kind of cosmic conspiracy, I know. Joey DeMaio (officially the loudest bass player of officially the loudest band in the world, MANOWAR — source — Guiness Book of Records) has just answered the phone. Within nanoseconds, the beeps start. «Look just hold on there Joey, I’ll get rid of this call» and so it goes, ultimately ignoring the pesky blips, I manage to accumulate 8 goddam messages, then the phone is silent for the best part of the rest of the day. Go figure! What can I say about ManowaR? Just that they are incredible and the most loyal metal band in the world. Well, they are releasing the video Hell on Earth Part 1 and when you read this interview you will be certain that this video probably will be one of the best metal videos of all times. This interview was done with Joey DeMaio (B), the man that conduct ManowaR, and when you see his answers you will see that ManowaR preach the eternal passion and fight in name of Heavy Metal. Only one advice before you read it: “Whimps and Posers, Leave the Hall”! Dedication, loyalty, and staying true to what you believe in, is what I think of when I listen to Manowar. I’ve been a fan of the band since their first album Battle Hymns, and always loved what they stand for. After eight studio albums, they recently released not one, but two live albums. Hell on Wheels Live, and Hell on Stage Live. I recently spoke with Joey DeMaio about the live records, the new live video Hell On Earth Part # 1, former guitar player Ross The Boss and about metal in general. 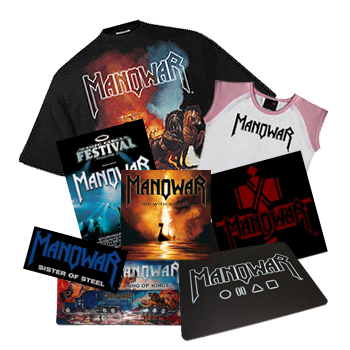 The bands official web site www.manowar.org is packed with great information, and is a great site to bookmark and visit frequently for all band news, and merchandise. Thanks go out to Alan and Joey DeMaio for making this opportunity. MANOWAR have kept the faith and now they’re back on a major label with some great tunes. There are a couple of almost ballad type songs. I’m sure everyone can relate to the tune «Outlaw» since most bikers not unlike the early cowboys consider themselves outlaws. Two great, I mean great, songs come together in «Today Is A Good Day To Die» which comes from the great chief Crazy Horse. It’s what he told his warriors when they went into battle.»My Spirit Lives On» represents the ascendance of the warrior spirit and the transcendence of everyday life. These two songs paint a larger-than-life picture to all of us. I love this band. Piston Rod: How are you, man? Eric Adams: I’m doing good, brother! I’m doing great! I’m in LA, there’s sunshine, it’s 90 degrees… life is good!! There were a few sniggers amongst the girlies in the office when I announced that I was going to speak to MANOWAR about their new album, «The Metal Kings». Chest beating Vikings in leather codpieces don’t cut much ice with the Hammer Raunchettes and tracks like «Pleasure Slave» (the extra track on the «Metal Kings» cd) bring hoots of derision from a bunch of wimmins who are all more than willing and able to club any unsuspecting geezer over the head and drag them back to their cave. And as for the news that Ross the Boss has left the band to get married…! Hey, we thought he was a real man!